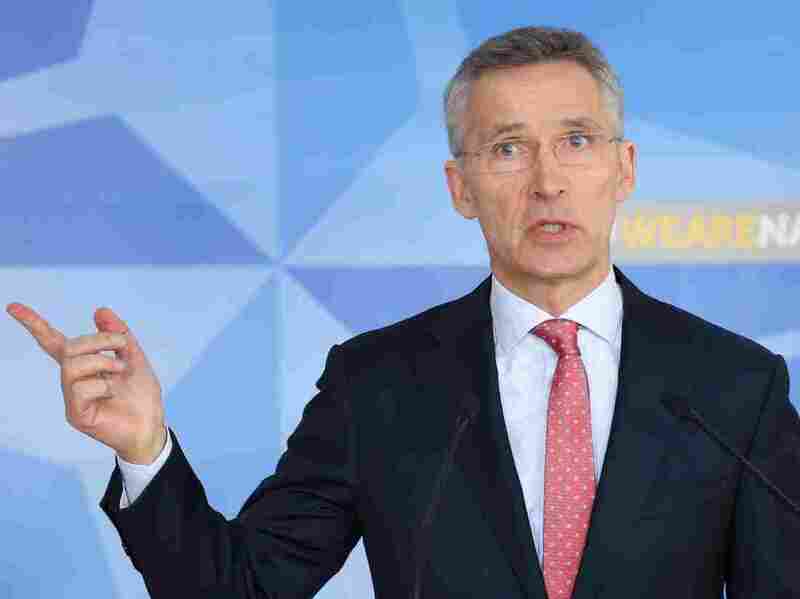 NATO Announces Expulsion Of Russian Diplomats Following Nerve Agent Attack : The Two-Way Secretary-General Jens Stoltenberg, speaking at a news conference in Brussels, said the alliance was withdrawing the accreditation of seven staffers of the Russian mission. NATO Secretary-General Jens Stoltenberg speaks during a news conference to announce the withdraw of accreditation for staffers of Russia's Mission to NATO, in Brussels on Tuesday. NATO has followed the lead of many of its member countries, expelling Russian diplomats in connection with the nerve agent poisoning of an ex-double agent Sergei Skripal in southern England earlier this month. Moscow — which has suffered a major international backlash over the incident — called NATO's move "boorish" and insignificant, but nonetheless vowed to retaliate. More than 20 countries on Monday announced expulsions of Russian diplomats in response to the attack on Skripal, 66, and his 33-year-old daughter, Yulia. NATO said Tuesday that it would withdraw accreditation for seven staff members of the Russian mission and deny pending accreditation to three others. "[We] will continue to work for meaningful dialogue" with Moscow, NATO Secretary-General Jens Stoltenberg said at a news conference at the alliance's headquarters in Brussels. He said the announcement was meant to "send a very clear message to Russia" that its action "has costs." The Skripals were found slumped on a bench at a shopping center in Salisbury, in southern England, following the March 4 attack. The two have been in a coma since then and British Prime Minister Theresa May said earlier this week that they "may never fully recover." A nerve agent that was developed in the Soviet Union in the 1980s and is only found in Russia poisoned the Skripals. The White House earlier this week said it was expelling 60 Russian diplomats. President Trump spoke Tuesday with the leaders of France and Germany — which expelled four Russian diplomats each over the Skripal affair. Trump "expressed support" in conversations with French President Emmanuel Macron and German Chancellor Angela Merkel, the White House said.